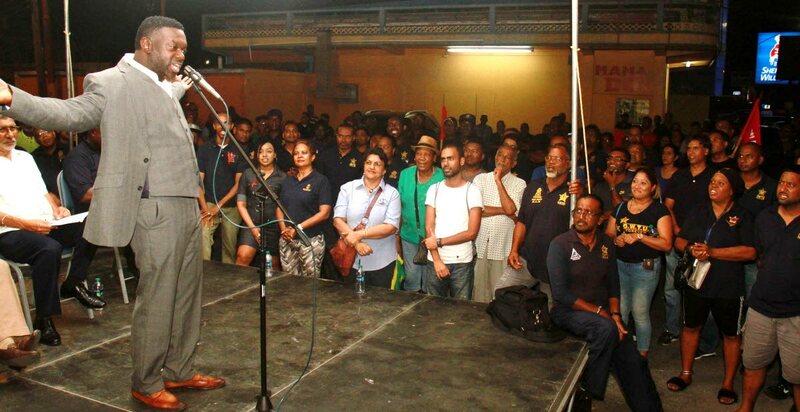 PUBLIC Services Association (PSA) president Watson Duke was in a fiery mood on Wednesday night as he called on members of the Oilfields Workers’ Trade Union (OWTU) to shut down the country for a day. He said he is confident that the OWTU is going to win this fight against the government, which was looking to sell out Petrotrin. In reply to the Prime Minister’s statement that he has a court case, he said he is prepared to take more. “You are a one-term prime minister. I can guarantee you that. Dr Rowley is asking about selling shares in Petrotrin, he said. “We are not interested. I want to ask Rowley, can he guarantee the price of oil and gas for the next ten years? He reminded the PM of those who will be taking the day off today, who he said included civil aviation and Airport Authority staff, Customs and immigration officers, and WASA workers. He called on civil servants to rest and reflect today too, pointing out that one day’s sick leave does not require a doctor’s certificate. Duke said he will take Rowley’s PNM seat in Tobago come the next general election. President general of the OWTU Ancel Roget took over the microphone to say the PM and PNM ministers were fooling the country with propaganda. The OWTU, he said, represents the working class. Today is the third anniversary of the PNM’s coming to power under Rowley and the OWTU was giving the administration a fail rate for the way it had handled the health system, agriculture, crime and in the labour industry. Reply to "Be prepared to die, Duke tells oil workers"